Pictures: Please browse the selection here. The picture is courtesy of Gary McMahon. The picture is courtesy of Gary McMahon. The stadium was opened on 8 August 1959 by Sir Arthur Porritt and was named after a local entrepreneur. It was upgraded to a synthetic (Tartan) track on 16 Jun 1974. The track is surrounded by a 460m cycle velodrome. The covered stand was built in the 1970s. The Notts. AC clubhouse is at the track. The adjacent sports centre opened in 1990. The main finish line was remarked in yellow by Athletic Markings Ltd. in 2001. 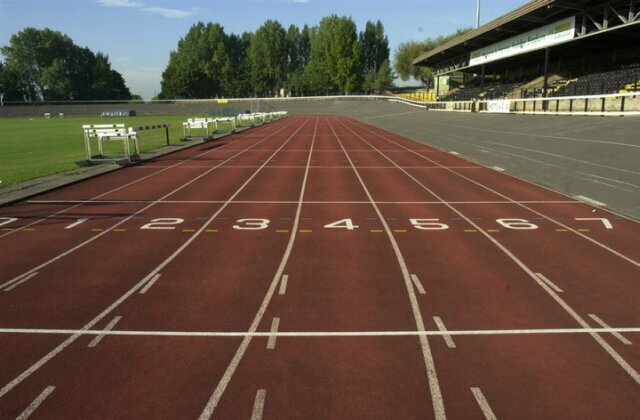 The finish lines for 100m and 110m races are however 5m and 15m respectively past this yellow line. There is an indoor straight next to the track.